When flying to the United States of America from an overseas destination, travellers aboard long-haul flights often have a layover in Atlanta International airport. Officially known as Hartsfield-Jackson airport, this major air travel hub in the US stays open 24 hours, and so does its main TSA security checkpoint and selected restaurants across its facilities, which operate around the clock. Its working hours invite jet-lagged globetrotters and backpackers to spend the night in the facilities before catching an early morning flight but, truth to be told, nothing compares to a cosy bed in a warm hotel room in these cases. Thus, if you are a business traveller or you plan to embark on a long journey either back home or towards your next destination, you are advised to stay in a hotel near Atlanta airport when having an overnight layover in the city. 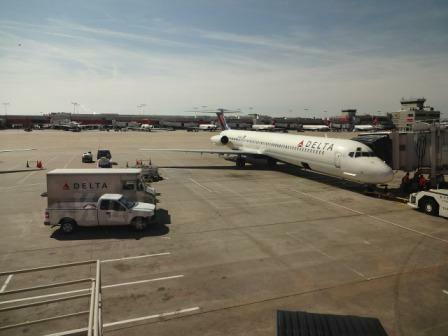 Hartsfield–Jackson Atlanta International Airport (ATL) lies eleven kilometres south of Atlanta city centre and ranks second as airport with the highest volume of passenger traffic in the world. In fact, it handles international routes to and from other US cities and destinations in South America, Central America, Europe, Asia and Africa. Such a huge number of operations are distributed among two distinct landside terminal buildings and seven airside concourses, of which E and the recently inaugurated F are the ones dedicated to international flights. Whether you are flying from outside the US to catch a connecting flight towards a domestic destination or, on the contrary, you are commuting to ATL to leave the USA aboard an international flight, chances are that the domestic leg of your journey will be operated by American Airlines (to and from Charlotte, Dallas Fort Worth, New York La Guardia or Phoenix Sky Harbor among others), Delta (to and from Albuquerque, Austin, Chicago Midway, Colorado Springs, Columbia, Daytona Beach, Denver, Fort Myers, Greensboro and many others), Frontier Airlines (Las Vegas, Long Island, Los Angeles and Salt Lake City, for instance), JetBlue (Boston and Orlando) and Southwest Airlines (Baltimore, Detroit, Houston, Kansas, Richmond, San Antonio, San Diego, Tampa and Washington Dulles). Sleeping in a hotel near Atlanta airport in the USA will ensure that you will get some good rest after your inbound flight to make your connection refreshed and revitalised. If you are travelling for work to a destination within the country, it will enable you to attend your appointment with a clear mind, otherwise, it will prepare you for the long journey ahead. There are various good options for accommodation around the facilities of Hartsfield-Jackson Atlanta airport, some of them right by the terminal buildings -as is the case with the 4-star Renaissance Concourse Atlanta Airport Hotel– and others within a short distance that can be conveniently covered thanks to the complimentary shuttle buses provided to guests. The Renaissance transit hotel in Atlanta International airport is located next to the complex affording views of the runway. Its rooms are soundproofed and feature flat-screen TVs, WiFi internet and other amenities. The premises also comprise a fitness centre and business rooms, and a varied daily breakfast is available at a surcharge. A cheaper airport hotel close to ATL is the Econo Lodge, roughly three kilometres from the terminals yet providing confirmed guests with free shuttle services, an outdoor seasonal pool, high-speed WiFi and in-room microwave and fridge. Despite the low nightly rates, travellers enjoy fully-equipped private bathrooms and complimentary continental breakfast. Also within easy reach thanks to a free airport transfer service, the Sleep Inn Atlanta airport hotel has the additional perk of enabling guests to commute to the nearby Georgia International Convention Center when the visit Atlanta for business. The reservation of one of its cosy rooms entitles visitors to use the WiFi, enjoy breakfast daily, leave their car on an on-site parking space and work out in the fitness centre, to mention but a few of the amenities offered.